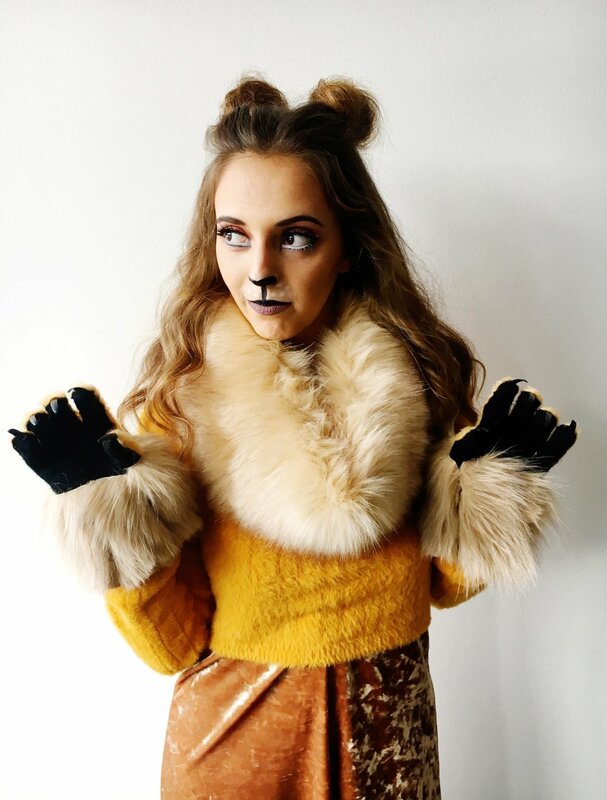 ROAR ;) This might have been my favorite Halloween costume I've ever done! My team at work got a little freaky this year and became a Circus Freak Show! 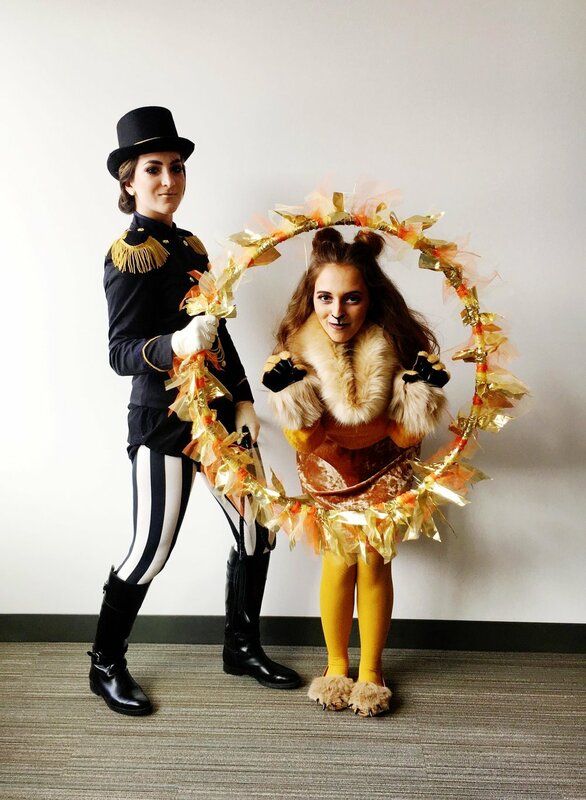 We were complete with a bearded lady, a ring master, a magician, and a little lion with her tamer ;) Scroll to the bottom to see the whole team! We killed it if I do say so myself. This costume was so fun to put together. I was most excited to do the hair and makeup. Mainly because I have always wanted an excuse to wear some space buns ;) For my outfit, I really wasn't exactly sure what I was looking for but I went into Forever21 for a bit of inspiration and boy let me tell you, did I hit the jackpot! Everywhere I turned, there was a tan-ish colored velvet dress and whole bunch of mustard sweaters. It couldn't have been more perfect. And then I found the faux fur infinity scarf that was perfect for the mane. Keep scrolling to see how I made the paws and feet. 1. Cut a strip of fabric 6 inches wide, you can make it however long you want. 2. Fold the fabric in half, then sew the two sides together. 3. Sew one end closed. 4. Stuff your tail with the stuffing. I used a ruler to pack it in. 6. Cut a strip of fur for the end of the tail, I shaped mine to have a bit of a point on the end to make it look more realistic. I would suggest gluing the fur onto the end of the tail before shaping it. 1. Take your black knit gloves, place them on the tan fabric, and trace the shape of the glove. Make the shape larger than the actual shape of the glove. Cut them out. 2. Take your fake nails, trim them so they have pointy ends (these ones are actually "witches nails" from the halloween store, the ones I used for the feet were the fake nails from Sally's), then paint them with black nail polish. Once they are dried, use the hot glue to glue them onto the fingertips of the black knit gloves—top of the gloves facing up. 4. Next, cut out a strip of the faux fur to the desired thickness. Glue around the circumference of the bottom of the glove.